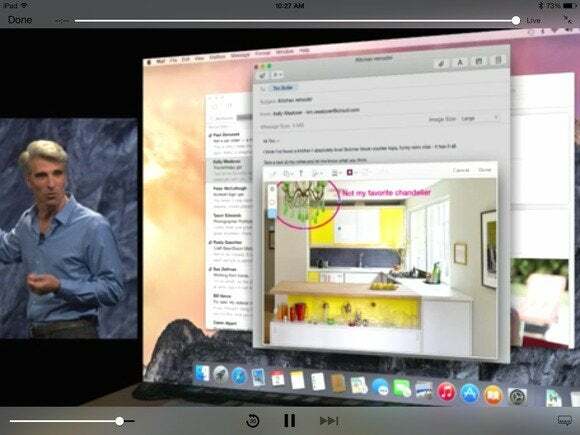 Among the many changes to Mac OS X announced by Apple at WWDC come significant tweaks to Apple’s Web browser, Safari, and Mail. Safari, like some other Yosemite apps previewed by Apple, adopts a cleaner interface. In its default form you see simple navigation controls, a smart search field, and Sharing and Tabs buttons. But the app hasn’t been stripped of its functionality, it’s simply that some functions you’re accustomed to seeing in the toolbar have been tucked away. For example, a grid of Favorites becomes visible when you click in the smart search field. Just click on one of the resulting icons and you’re taken to the associated site. Favorites will be accessible from the smart search field. When you click on the Tab View button in a window’s top-right corner any open tabs are displayed within the browser window as thumbnails. (If you have multiple pages open in a single site, those thumbnails are stacked.) This view additionally displays tabs open on other devices associated with your iCloud account. And if you have a tab bar choked with tabs you can simply swipe through them to find the one you want. Safari’s searching capabilities have been expanded as well. Enter a search term in the smart search field and Safari will produce not just Google or Bing results, but also those from Wikipedia, Maps, news, and iTunes. Yosemite’s Safari additionally offers an advanced Private Browsing mode—one where your browsing actions aren’t tracked or saved. With today’s Safari you can switch on Private Browsing but it applies to all open Safari windows. With the next version of Safari you’ll be able to create a window and devote it—and all the tabs within it—to private browsing. As with Safari on iOS devices, the color of the browser window will change to help you identify private windows. You can maintain separate windows that aren’t configured to be private. Apple demonstrated two major changes in Mail—Markup and Mail Drop. If you’ve ever grabbed an image, pulled it into Preview to annotate, and then attached it to an outgoing email message, you have the idea behind Markup. With it you can attach an image within an email message and then—as the name implies—mark it up. For example, you can add shapes, text, callouts, arrows, and magnification to your images. And, as you can with Preview, you can fill out PDF forms and add your signature by either drawing it or using a signature captured with your Mac’s camera. Preview no more. Mark up images directly within Yosemite's Mail app. Mail Drop provides the means for sending large attachments. When you attach a large file (a video, presentation, or a folder full of images, for example) and send it, it’s uploaded to your iCloud account. If the recipient is also using Yosemite’s Mail they’ll see your files as attachments, just as they always have. If they’re using a different client or access email through webmail they’ll see a link instead. Click that link and they can download the attachment. You can attach up to 5GB of files per message. Updated at 9:39 p.m. PT to add a video report.